The Evo Powerboard Uberscoot 1000W Electric Scooter was exactly what I wanted when I was choosing an electric scooter for adults. I didn't want a toy Razor scooter but i did want something that could be used as a utility vehicle. The price has come down in this 1000w 36V Uberscoot model because it has now been superceded by the more powerful Uberscoot 1600w 48v Adult Electric Scooter. That price drop was a great signal that I should get hold of one and try it out! To be clear about these types of electric scooters, they are battery powered electric scooters and you cannot kick-push them like a regular kick scooter. Because I wanted to get around easily without breaking a sweat and to make short trips without actually using a car. That made this Evo Powerboard Uber scoot 1000w just perfect. The Evo Powerboards company make the Uberscoot brand of electric scooters. They have been in business for over 10 years and started life in South Africa. Originally a Brand of the Puzey design company which also made Big Boy Scooters and Blaze Scooters. Evo Powerboards know the business of high quality electric scooter manufacture inside and out. Now with over 15 different models of electric scooters on offer, the Uberscoot electric scooters are among the most powerful and rugged machines in their class. Do not confuse these bad-boy power machines with toys! They are far from toys and are instead considered to be PTV's or Personal Transport Vehicles. It's wise to gear-up with helmets, pads and gloves to avoid bums and scrapes if you do happen to have a minor accident on one of these electric scooters for adults. I didn't need a license or anything like that, but it offers a consistent way to make up some time when commuting to work or just going out to do local errands. As it can fold, it's OK to take it on the train or pack it in the trunk of your car. I use the train for commuting, so this is handy. One issue to mention right off the bat. It's to be expected but It's a bit heavy at 88 pounds. Hopefully you will not carry it for long distances. I know I won't! As I mentioned, the Uberscoot 1000w has now been superceded by the similar but more powerful version - the 1600W 48V model but the original is a great buy because it's come down in price. There are a few things that I paid attention to when purchasing the product that I wanted to share with you here. I also wanted to know why people call this the best electric scooter with a seat for adults. 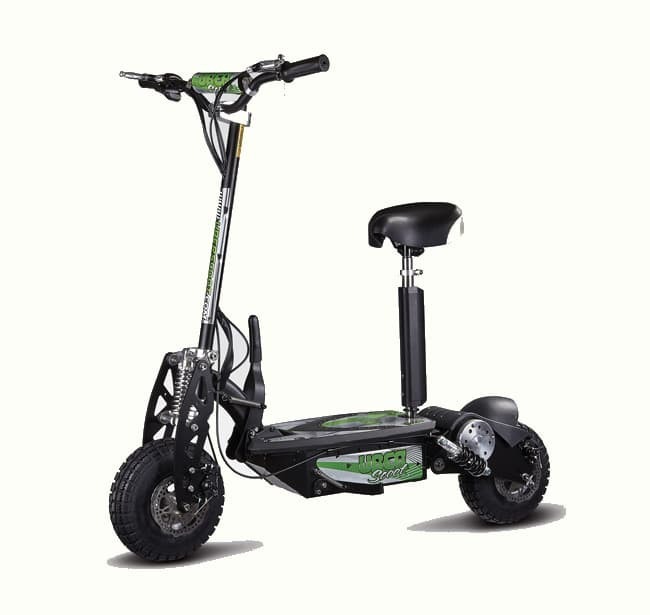 What does the Uberscoot 1000w by Evo Powerboard Electric Scooter Come With? This adult Uberscoot electric scooter comes with 10” wheels on the 36V model. It is CE certified and it folds fairly well for simple storage and easy carrying. It has a remove-able seat along with three standard 12 volt and 12 Ah batteries that make up the 36 Volts. The electric motor itself is 1000W of pure power and has a black and red design wit the choice of all terrain or typical concrete tires. The fork is made from aluminum for keeping it lightweight and has alloy wheels for added lightweight durability. They do last, at least that's what all the reviews say about the tires and wheels. It has a top speed of about 30 mph for each charge depending on what type of surface you're driving on. However, don't expect 30 miles per hour going up a steep hill because it definitely does not have the torque or gears that a motorbike has to maintain that kind of speed up a hill. The electric scooter has both front and rear brakes for immediate stopping. The comfort of the ride is also catered for because it has swinging arm suspension, similar to a regular motorbike with dual shocks on the front and rear forks, again this is similar to what you would find on a motorbike or an expensive mountain bike. The brakes are disc brakes which means that they are similar to a modern car or motorbike and much more efficient than the drum or bicycle type brakes than a kick scooter has. These will definitely stop the electric scooter when it's traveling at speed. These Evo Powerboard 1000w adult scooters also come with LED lights so you can ride it at any time of the day or night. This is a sign that Evo Powerboards take this electric scooter seriously as you will find that the more toy-like Razor scooters do not have lights on them. How About Building The Electric Scooter Out Of The Box? Constructing this adult electric scooter is best done when you have a couple of hours spare so you don't have to rush it and can do a proper job. One of the reasons I give this 5 star rating is that it really doesn't take much to build, especially as some of the attachments like the LED lights, seat mount and some of the wires just clip on. One of the more difficult tasks was adjusting the brakes. In the manual they say to adjust the brakes to suit the rider. In practice, though I didn't really know what this meant. But as long as they feel OK to you and they stop the scooter in a comfortable way then I guess that's what they mean! The Scooter, of course comes with full building instructions so if you have any questions you can always consult that, but I honestly found it pretty easy. I am no genius when it comes to these things but regular flat-pack furniture is a lot more complicated. If you have even half a mechanical mind, you will find this no problem at all. There are some adapters that come with the battery which is useful for charging in different countries, but I don't intend to take this abroad! One point to note is that the battery does not come pre-charged so you should charge for 12 hours before you ride your new scooter. In fact it's a good idea to charge the battery as soon as you receive the package. Then when you come to build the scooter later your battery will be ready for use. All in all it's a simple set up to build this electric scooter and anyone who has ever played around with a bike should be able to do it. Most of the materials are made from aluminum meaning that they are specifically designed to be lightweight and offset the weight of the battery which is the heaviest component. There is also a fair amount of steel made within the structure that lends to it being durable and its weight is around 88 pounds. It feels solid and weighty when riding which is great. The battery is a dual charge battery that has a max life for about 10 miles, not bad for a local run or commute from the train to the office. The handle bars aren't really that high, but they are suitable for anyone from 12 years and older. It is really designed for sitting rather than standing so if you are sitting on the seat the handle bar height shouldn't be a problem for your back. This will not work for anyone over 5'11 feet so if you are very tall you will find it an uncomfortable ride in my opinion. The wheels are pneumatic street tires that work well with grip and have some longevity to them. These tires are claimed to last over a year depending on the use and that looks about right id I compare that with my car tires or mountain bike tires. The brakes are high-quality disc brakes and will always aid making a sharp stop when required. There hasn't been any issue with mine, but but make sure that they are installed properly as poor connection of the brakes and pads can sometimes cause the disc to offset the steering in a weird way making it very difficult to ride properly. As I mentioned before , take some time installing the brakes and getting that part right when building this scooter, it's the hardest part of the build. The throttle on the right handle bar grip is worth mentioning because it has a turbo mode for full power or a regular mode for easy cruising on a flat road. The safety features are fine, but nothing too fancy. You are rather exposed when riding this scooter so it's not a great ride for busy roads or in fast traffic. The manufacturers do stress that a helmet is worn and at speeds of 30mph especially for a child, this is definitely something to pay attention to. If you need to buy a good child's safety helmet then of course we have a guide for that! Even for adults, be very safe and take care when riding this little machine, it's not really a toy - more like a mini motorbike. Just don't race anyone or run any red lights and you will be fine! 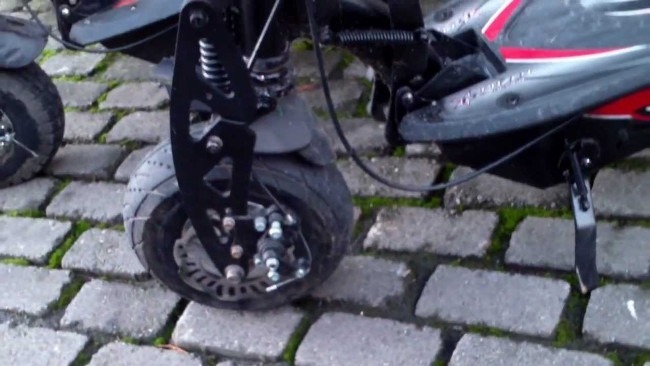 Just like a motorbike, there is a small but sturdy steel kickstand that you can fold out with your foot to keep the scooter upright when it's parked. With all of my personal comments, it is rated the best electric scooter with a seat for adults on Amazon and that is why it's a best-seller. It's popular for a reason and it has a quality warranty of about 60 days from the time of purchase. As long as you used the right tools to build the product, EVO Powerboard will honor your warranty. So make sure you don't use any funky tools that were not supplied with the kit! I read that sometimes the boxes show up tattered and damaged, but ultimately there aren't any lasting issues as that's more about damage to the box that accured when shipping it. 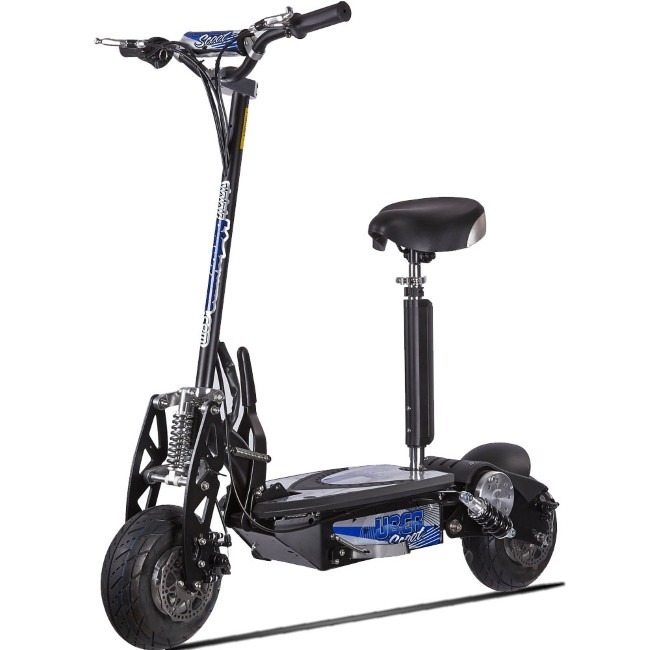 Buy the updated Uberscoot 1000W 36v model now. As the 1000w model featured in this review has now been updated to the more powerful 1600W 48v model, the price has got cheaper on the 1000W 36V Uberscoot and at $499 it's a great buy. Ulitmately, if you want one of the best electric scooter with seat accessories for adults on the market and anything under a 10 mile range is good for you, you cant do better than the Uberscoot by Evo Powerboard! We hope you find our star Uberscoot product reviews helpful. If you know these items or any similar Uberscoot scooter, please go ahead and leave a comment below! worlds best scooter 1000w 36v !!!!! 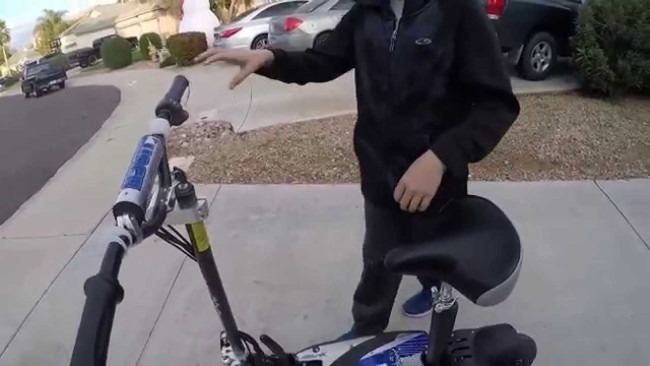 Video of worlds best scooter 1000w 36v !!!!! Gotta say we love this adult electric Scooter. Top quality and a best-seller on Amazon! Hi would you mind letting me know which hosting company you're working with? I've loaded your blog in 3 different internet browsers and I must say this blog loads a lot faster then most. Can you recommend a good hosting provider at a honest price? Thanks a lot, I appreciate it! This Uberscoot is definitely a five star!